I included this disc in my round-up of Christmas discs, but as it is perfectly apposite for the season as today is Epiphany so I thought I would write in greater detail. 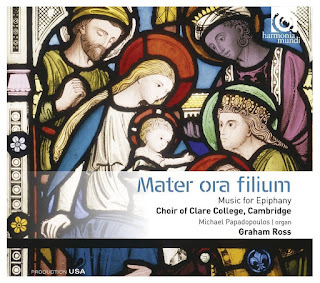 Mater ora filium is the latest disc from Graham Ross and the Choir of Clare College, Cambridge on Harmonia Mundi where they explore music for a particular liturgical season. Here Ross casts his net widely with music for Epiphany by Lassus, John Sheppard, Byrd, Palestrina, Jean Mouton, Peter Cornelius, Poulenc, Howells, Warlock, John Jacob Niles, Lennox Berkeley, Arnold Bax, Judith Bingham and Judith Weir. The composers fall into three main groups, those from the 1400s and 1500s, those born in late 19th and early 20th century, and the two contemporary Judiths. 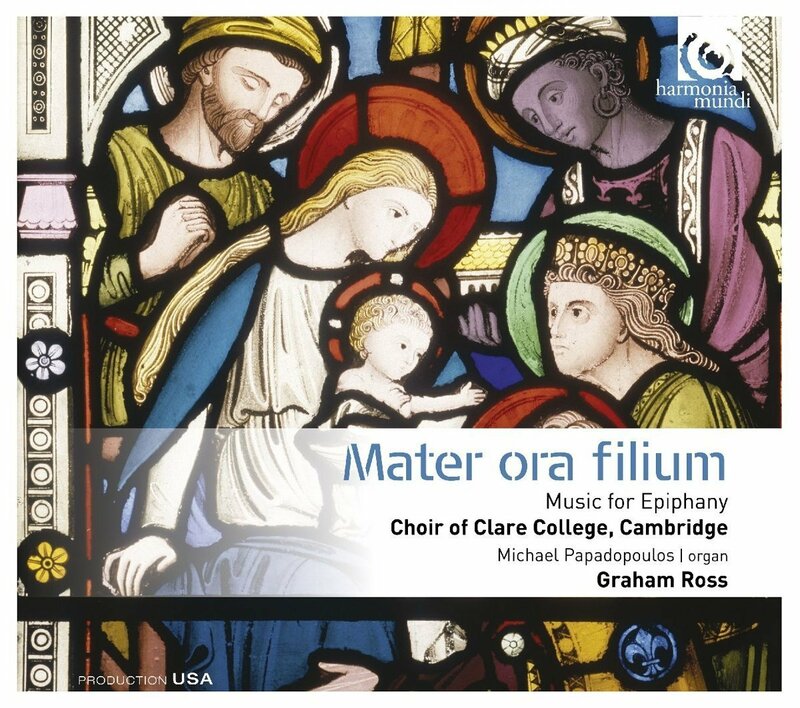 The culmination of the disc is the title track, Bax's mammoth Mater ora filium, Ross also punctuates the programme with three hymns which form nice pause points. The recording gives a strong sense of the generous acoustic, and this is filled with the choir's bright, smooth timbre and flexible tone. These are young voices, 28 in total giving an appealingly confident and stylish performance. You really get to appreciate the long unfolding lines and rich texture in Jean Mouton's motet Nesciens mater, rightly the culmination of the early group of motets. But the join from Nesciens mater to Poulenc's Videntes stellam is something of a jolt, and I wondered if the choir's attack in Poulenc's opening was ideally clean. Warlock's Bethlehem Down is sung David Hill's arrangement for choir and organ, which interleaves the choral and solo song versions, to slightly odd effect. This is not helped by Graham Ross's rather lugubrious tempo (something which re-occurs in the Rutter/Niles I wonder as I wander). It was lovely to encounter Peter Cornelius/Ivor Atkins The Three Kings (Atkins turned Cornelius's solo original into a choral classic). Judith Bingham's Epiphany is a terrific piece, with fascinating complex choral harmonies and a great organ part making an imaginative whole.Judith Weir's Illuminare Jerusalem is equally appealing, with its spiky, bright, brilliant harmony and vivid rhythm. But it is Bax's Mater Ora Filium which is the fitting climax. The performance has a lovely sense of youthful voices in the sound and shape of the vocal lines, and the first sopranos really do nail the outrageous top C, lasting three bars. An impressive achievement indeed. This is one of those programmes where you can listen with pleasure from end to end, or simply dip into for one of the many highlights. Recorded 10 & 11 January 2016 in All Hallows Church, Gospel Oak, and 23 January 2016 in the chapel of Tonbridge School, Kent.